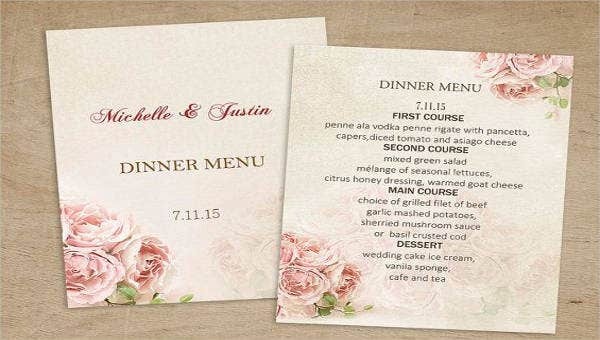 Menus can be explained in different ways. 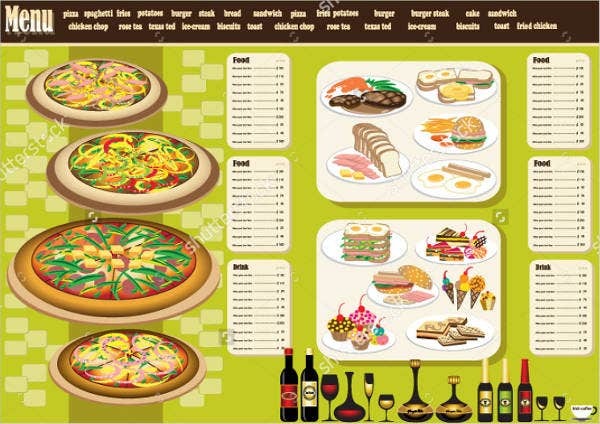 There are menus used as a computer application to help users know the function of a program. 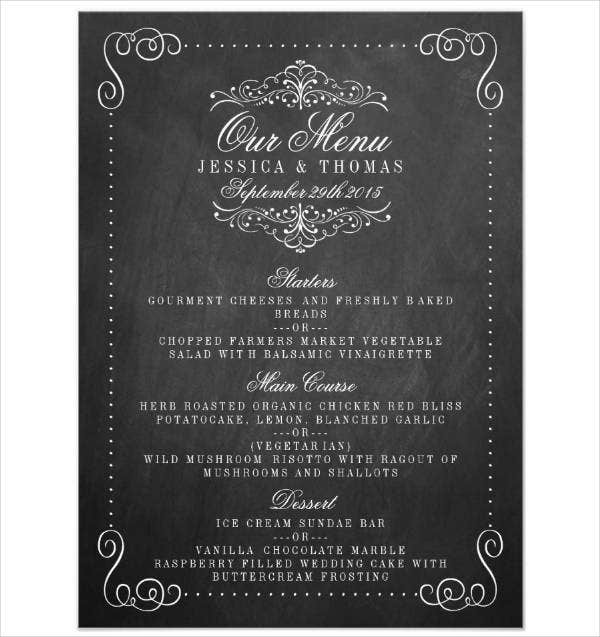 But the menu we are talking about is the menu you can see in any food establishments or restaurants. 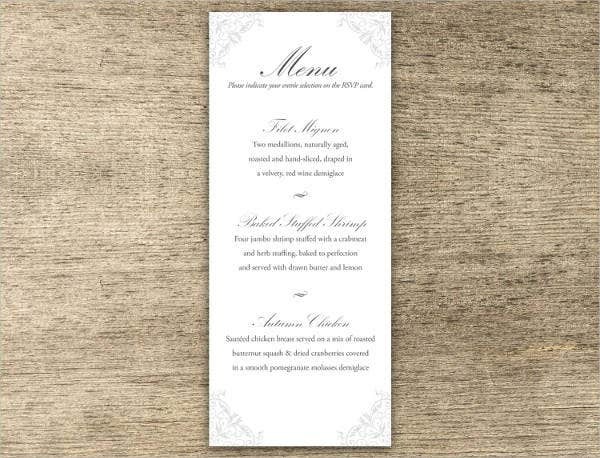 Menus that are used to check available food or food to be served in a certain restaurant or at a meal.If you are planning to create an Elegant Menu Template specifically for a wedding party, our menu templates for wedding parties are a great deal! There are 9 choices that you can select from. Go check them out. One of the most memorable and exciting milestones in our lives is when we enter the stage of marriage. Getting married is not that easy, and there are things you need to plan way ahead of time and things that you need to consider before deciding. 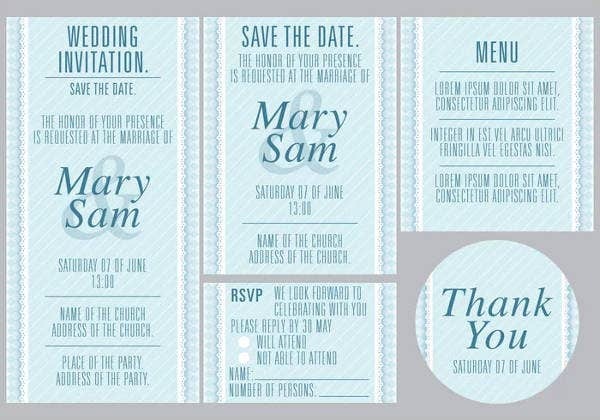 Weddings are ceremonies where two people are united as one in a form of marriage. 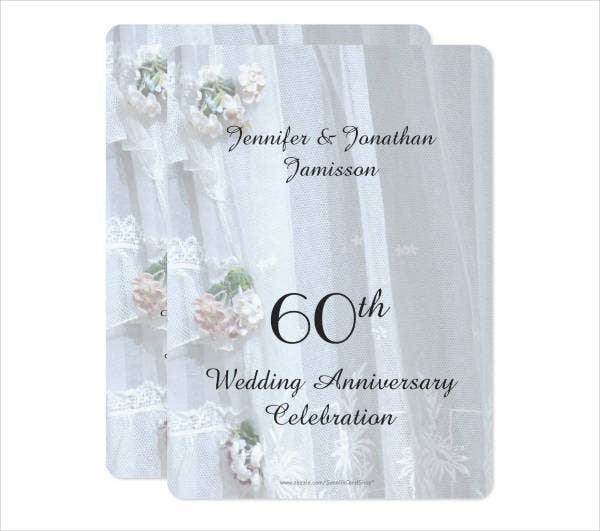 Wedding traditions and customs differ greatly between cultures, natives, religious beliefs, countries, and social norms. Majority of wedding ceremonies include an exchange of marriage vows by the couple. 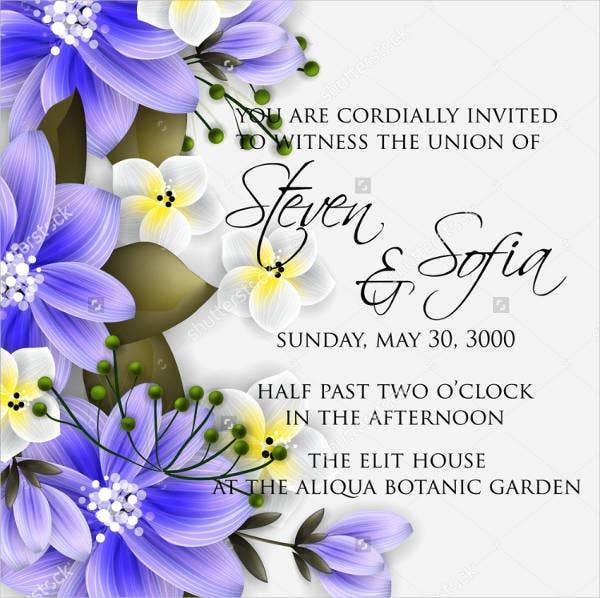 Gift presentations, rings, items that symbolize marriage, flowers, money, and a public announcement of marriage by the highest authority are some common elements in marriage across all walks of life. There are civilizations that adopted the traditional Western custom of the so-called white wedding. In this, a bride wears a white wedding gown or dress and a veil. This type of wedding was famous through the marriage of Queen Victoria. Some say that Victoria’s preference of a white dress may have simply been a mark of prodigality; however, it may also have been influenced by the values she grasped, which emphasized sexual purity. 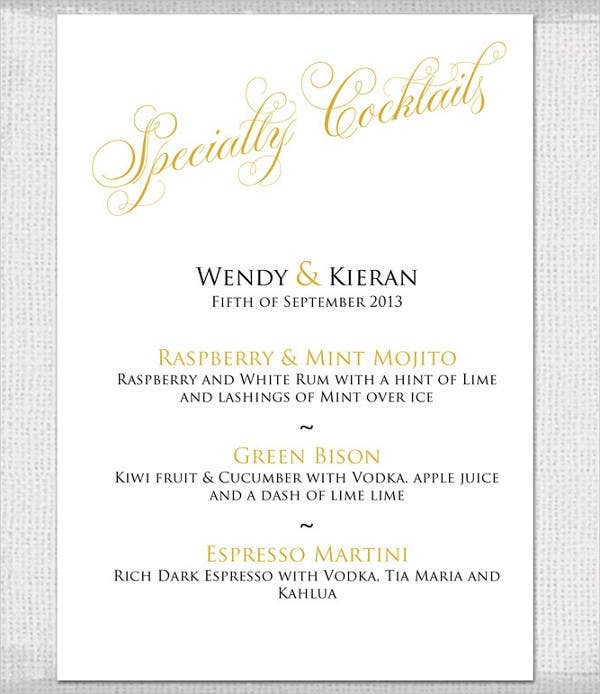 If you are looking for more wedding menu designs, go to our Wedding Menu Templates page for more. 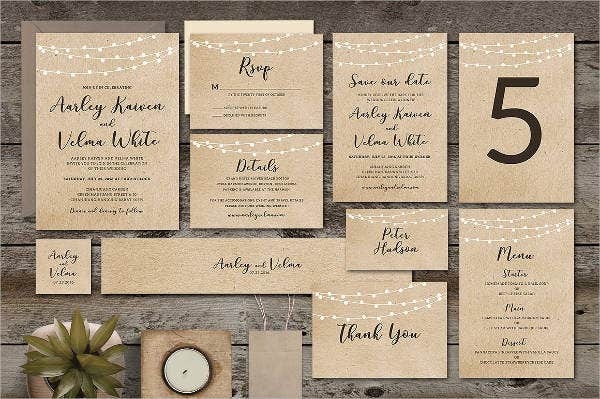 Wedding ceremonies are frequently continued by wedding receptions or wedding breakfasts, in which the rituals may involve speeches from the groom, father of the bride, best man, the bride herself, the newlyweds’ first dance, and the cutting of the cake. There are choices for you to pick and each comes with catchy and unique design. They are all in a good-quality resolution for clean-cut image details. 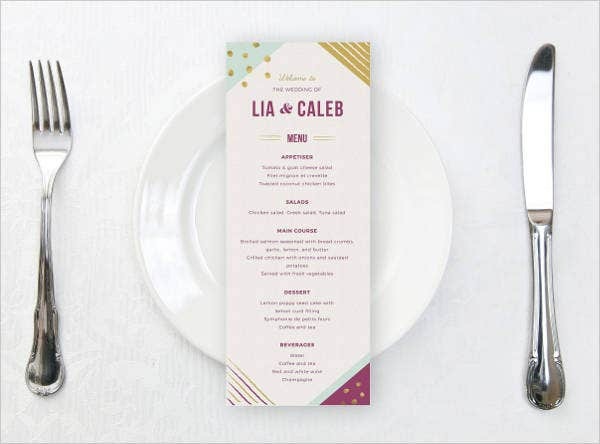 The color palettes are elegant and sweet and truly great for wedding parties. So what are you waiting for? These are all yours to utilize. Share this page with your friends too! 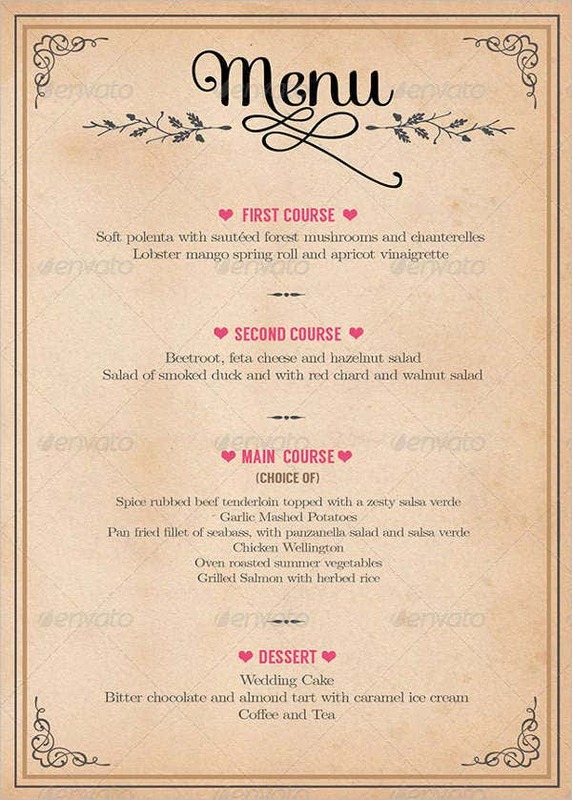 And just in case you are all looking for a great dinner menu layout, our Dinner Menu Templates are also yours to check out.